Mohsin Rashid lives in Ishbar, a Nishat satellite. In his modest home’s rough-walled room, he is busy in the corner, apparently fiddling with the paper cones. Maroon curtains of the 12 x 12 room restrict sunlight and permit Mohsin and his two sisters’ tweak produces Origami products. They all watch cartoon stories on TV while working with paper cones. 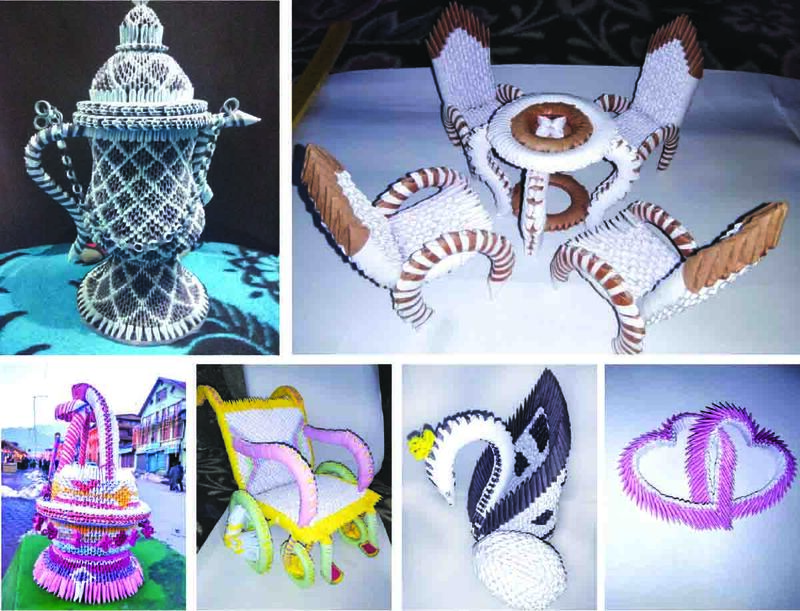 Mohsin Rashid is an Origami artist who has linked his passion with the economic situation at home. He makes paper art from the cones for the market. This is preventing him from taking his passion to the next level. A student of B Com in Islamia College of Commerce and Science, he is living with his three siblings and an ailing mother. He has lost his father, Abdul Rashid in 2001 when he was 12. Mohsin’s talent was first discovered by his school teachers in Shalimar Higher Secondary in 2014. During 12th class, he once became familiar with the origami art on the internet. “I tried my hand in it and managed to form a paper swan and gifted it to the principal of my school,” Mohsin said. “He appreciated it and asked me to continue making products.”This made him famous in the school. Origami is basically the Japanese art of paper folding in which small paper-bits are combined in a variety of ways to make intricate designs. “It’s all about paper and glue,” Mohsin said. Impressed by his art, two of Mohsin’s teachers, Mohammad Younis and Mudasir Ahmad motivated him to take his art to next level. Caught between passion and the ambition to make it a business, Mohsin works as a caterer to support his family. He utilises winters to make origami products. In order to indigenise origami, Mohsin has made products like Samavor, Shikarah, wheelchair, Phout ( Basket) and Kangri. In 2016, Mohsin participated in the art show Kala Utsav at Jammu. He showcased his art for the first time and bagged the second prize. Later, in a tourism-related festival at the SKICC, he bagged the first position. 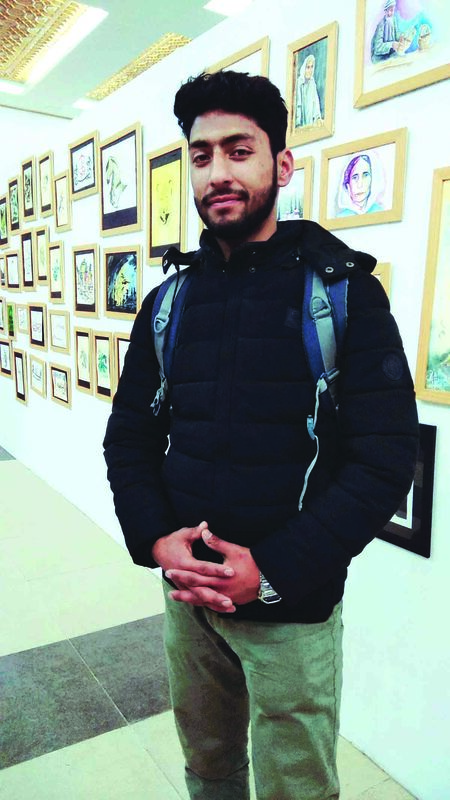 Recently, he exhibited his artwork in the Pahalgam festival also where all his products were sold and he took Rs 23,000 home. The Samovar sold for Rs 16,000. The young artist has earlier presented his artworks at many festivals in other states of India where he was appreciated. Off late, Mohsin said many young men are seeking his help in learning this art but he is not in a position to teach them as he lacks support. “It needs an academy, which I cannot afford as it requires huge funds,” Mohsin said. Mohsin is living a dream. He hopes that the government-run schools will one day start producing artists as well, and not “bookworms alone”. While Mohsin is being helped by his twin sisters Hina and Nusrat Rashid, both pursuing BTS from Amar Singh College, his teacher Henna, who teaches at Kothi Bagh Higher Secondary School, is also helping him.